A) The first line of the story; in fact, the first couple of paragraphs in the story. B) Page 46, after the first Click, the lot of those paragraphs. C) Once the furor died down. See that’s the language/vocabulary of the author, not the “I” character. — It’s the difference in the constructs of the “I”. Think of I as A, B, C— these are three different characters/realities/perspectives. The problem then is that the story is using “I” and an “I” intrinsically will only have one identity unfolding that identity’s reality. But the “I” here is playing Holy Trinity, hahahaha. It’s less of a POV issue for me, as it is an immersion issue. — Dude, POV is immersion. Latter is dependent on former. How in the world can a reader be immersed in the story without the POV? The comic does a good job of immersing the reader in the setting while still keeping it accessible for readers who aren’t familiar with the Philippines. I love details like the use of Filipino sound effects (e.g “bog!” instead of “wham!”). Buena’s art is expressive and dynamic, with a subtle manga influence that makes everything extra adorable. It has a bit of of a sketchy feel because some of the pencils are visible, but it I think it’s aesthetically pleasing. It’s also relevant to mention that “On Wooden Wings”, my short story in Philippine Speculative Fiction volume 6 that is set in the same world as “High Society” (and which will become the first part of the “Wooden War” series) was the subject of an in-depth review/analysis by Jha over at Silver Goggles. It’s very interesting to read impressions of that alternative history from a reader who is not Filipino but who is a fellow Southeast Asian. I hope that by now you’re all excited to get your hands on the book (or, rather, the hardware holding the file), and if so, thank you and what are you waiting for? If you’re still on the fence even after the preview of our contributor and story introductions, and our author interviews (Raissa, Mo, Eliza), then read on (or download the press release here)! After the cut: one full sample of Mervin’s interior artwork, the full text of the book’s introduction, and excerpts from my interviews with Professor Herminia Meñez Coben and Fernando N. Zialcita. The new Flipside Blog is throwing the spotlight on Alternative Alamat (out this Wednesday!) and they have an interview I did with Charles Tan. Head here if you’d like to see me talk about the anthology, what gave me the most difficulty when I was putting it together, and why I decided to include non-fiction pieces. Note: Posting this a bit earlier in the week as there will be a major announcement on Thursday. We’ll also be holding off the PSF6 reviews for December but will resume in January. And so… Paging Adam David, look oh, more of your demand for experimentation in Phil Spec Fic! I know that this is not your favorite, Counsel, because it’s non-linear hahahaha! See, I think most would react to this story, after reading it, with “And so?” Yeah, what’s the point, right? Objection! I didn’t find the format difficult, but I think that’s because it was fairly obvious once I started the piece that I wasn’t supposed to find any narrative linking the segments, each of which was self-contained, and linear. I think my difficulty comes more from the experimental stories where I know (even if I’m wrong) there’s supposed to be an overarching narrative somewhere, and I just can’t seem to find it. I appreciate this kind of story being included in PSF anthologies because: 1) It challenges the reading-linear-habit which kind of breeds lazy-reading. 2) Because it does, then the brainwaves are exercised when it comes to perspectives and understanding of meaning, of what the story is really about. As someone who has never been a fan of difficult to read fiction (as opposed to non-fiction), I feel the obligation to state that lazy reading is a perfectly viable state of being a reader-for-pleasure. —-Hahaha, riiiiight. Like Lazy Boy and TV, hmmm? Intrinsically, this story is what you call playing on motif. So the question is: what is the motif? What is common among all the names? What connects them? Because the usual reader might think that they are not connected, as if the names are just slides in projection or just weird episodes (and the weirdness making it all under “speculative”). By “usual reader” that’d be me I think. I already said that I didn’t see the need to draw a narrative connection between each segment, but as far as a common theme, my anchor was the title itself: each segment used the idea of alternative names to show alternative realities (in my reading, all the protagonists are the same woman, in different worlds), and within each segment, the etymology of the name was interpreted through a short narrative. Lest anyone forget, the annual Philippine Comic/Komiks Convention, or Komikon, will be held tomorrow, Saturday, from 10AM to 7PM at the Bayanihan Center in Pasig (across Pioneer Supermarket). Don’t miss out on the cornucopia of indie comic offerings, not to mention what may be your only chance to get a physical copy of High Society. I’ll be at the Flipside Digital Content booth with less than a hundred copies of High Society ready to sell, and I might have to leave at around 5PM so that’s your window of opportunity. My partner in crime, the amazing Hannah Buena, will be at the con as well, but–being as in demand as she is–she’ll be flitting from booth to booth, so your best time to get your copies signed by Hannah will be sometime after lunch, maybe around 3PM. Beneath the cut is a map of the venue–Flipside is at E-31 to E-32, so that’s where I’ll be. Looking forward to seeing everyone there! 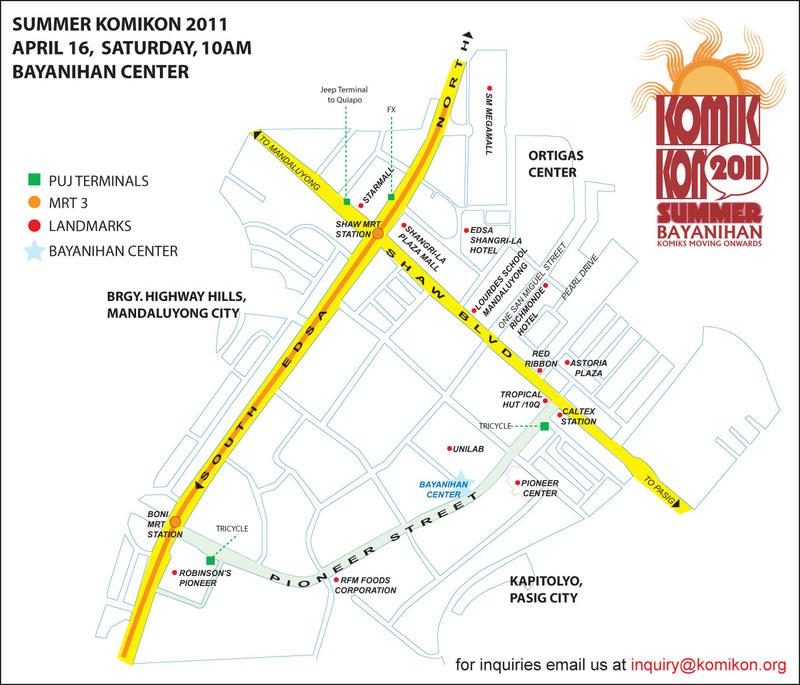 (And here’s a map to the Bayanihan Center if you need directions.) And, of course, there will be many other komiks at the con, most of which are only available during conventions. Macoy has a partial list and Flipgeeks has some previews as does the 100 Araw ng Komiks Facebook community. I’m probably not the ideal reader for this story, given that my appreciation for the fine art of cooking is limited to my enthusiastic consumption of its more fattening products. —-Haha dude, the unisex battle with the gut (and the thunder thighs and the flabby arms) is like the law of gravity especially when you hit the 30’s. — Hahahaha! Man you just crack me up! Nevertheless, I have to say that this being the first story I’ve ever read from Despi, I’m looking forward to reading more from her. She’s skilled at slipping the appropriate details into a descriptive sentence, to make a setting more concrete. — Yeah, it did make me initially hungry then it made me feel like I was watching a dragging cooking show because of these details. And because of the latter, the story lost its gruesome effect, that macabre effect in delicious cannibalism. C’mon, I wanted it to make feel “Yuuuuuuuuck…Sarap!” Just the way every time I watch Hannibal Lecter eating brain makes me want to eat Isaw or Ox Brain or Sisig.